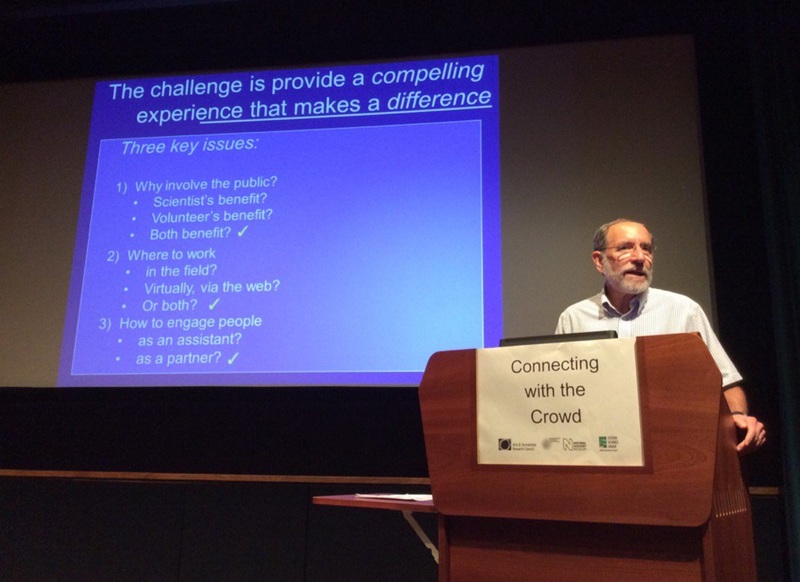 Last Friday I was at the Natural History Museum (@NHM_London) for an event on citizen science and crowdsourcing. It was called “Connecting with the Crowd” – you can look up tweets using #crowdsourcingNHM. I don’t want to spend too much time talking about what citizen science and crowdsourcing are. If you’re curious about citizen science, check out the Zooniverse where you can participate in “people powered” research. While crowdsourcing is used for-profit in big business, let’s for now go along with the idea that crowdsourcing in heritage contexts can be understood as digital volunteering. You’re volunteering, but it’s online instead of at your local museum or library. You may be transcribing handwritten text, tagging images or video clips. Crowdsourcing can be ethically murky, as many projects involve farming out repetitive tasks on a massive scale that institutions aren’t able to address professionally. I was curious to see whether the speakers at “Connecting with the Crowd” would address this. I was disappointed to find that they didn’t really, but the projects mentioned and issues raised clarified a few things for me in my mind. Most heritage crowdsourcing projects report “super-users” and “long tails”. In most projects, the vast majority of contributors make a small number of contributions, while a small core of “super-users” complete tens- or hundreds- of thousands tasks. There was a presentation addressing this directly, offering techniques to try to keep contributors engaged by sending reminder emails etc. when they had been inactive for a while. Sitting there listening to this I couldn’t help but think: surely most people don’t come back because while participating in “real” research may sound like a cool idea, the reality of performing these repetitive tasks is not that compelling. There was a presentation by the creators of the Zooniverse, who discussed a success story, where the discussion forum used by their users had led to contributors becoming co-authors in a professional publication using the crowdsourced data. This is a cool story. Those users really got to actively contribute to, and be involved in, cutting edge research – but the majority still just get to do grunt work, however colourful. The whole idea of crowdsourcing is to make volunteering efficient and to require as little of the professional as possible. By contrast, the Visiteering programme at the Natural History Museum let’s you volunteer in the museum for a day, working on a real project together with a real scientist. Through the day, it was highlighted that what makes citizen science participants come back is interaction with real scientists – this is the main selling point for the visiteering scheme. The closing keynote was by Dan Rubenstein on his citizen science work in Kenya. Before discussing his project, he highlighted the need to provide compelling experiences that make a difference. While the whole room agreed with his three key issues highlighted in the image below, few if any of the other projects presented at the conference live up to these ideals. He pays his participants a living wage, gives data collectors ownership of their data and includes them in data analysis. He doesn’t involve Kenyan’s in his work with the Grevvy Zebras because it saves him money, but because local people have the necessary local knowledge to do the work in their native landscape. Most citizen science and crowdsourcing projects are designed to provide exactly what the researcher needs, through an experience they hope someone will find compelling enough to do for free. This is obvious if you consider how these projects and websites are designed. You wouldn’t invite someone to volunteer at your museum without giving them any face-to-face time with a member of staff. You wouldn’t have them follow signs to a large room with a huge stack of papers for them to transcribe with just a post-it note on the table that says “thanks” – and hope that someone would leap at the opportunity and keep coming back, day after day. Using web-technology for volunteering makes it easy to keep volunteers at arms length and not worry too much about who they are, what they want and whether or not they find their role worthwhile – as long as someone else is there to pick up the work when they’ve had enough. If your goal is to work with volunteers as partners for all to truly benefit, this will be obvious in how you design volunteer experiences – whether online or in person. Providing meaningful experiences that make a difference isn’t simple and it’s unlikely to be efficient or cost-effective. Engagement activities shouldn’t be about saving money – if they are, how is that not exploitative? A few weeks ago now I ended a blog post on a bit of a cliffhanger. I said I wanted to write about trust and communication in collaborative work, but first I had to send a few emails – even though I didn’t know exactly what to say. It was difficult for me, but absolutely necessary. I’m going to work on being clear and concise – and on communicating more often. My research has changed a lot over the past year; my partners’ interests have probably changed too. It’s time to get back on track, but I need to remind myself that we should be doing that together, not waiting for me to figure it out and then try to get everyone else on-board. Those of you who know me well may remember that when I began my PhD, I was eager to talk about austerity as an opportunity, not just a threat. I wanted to move beyond merely protesting against austerity and do something productive in (or despite of) austerity. For decades, more progressive heritage professionals and academics have been promoting the idea that everyone has a right to identify their own heritage and be involved in caring for it, but little has changed in practice. I thought maybe the loss of professional capacity caused by austerity could be used to force change. If we want local people to care for their own heritage, according to their own values and priorities, maybe we need professionals to leave. Maybe, I thought, what the heritage sector needs, is a bit of a crisis. My current thinking is that there are two main drivers for including volunteers in caring for heritage. One is to save money (it’s cheaper to not pay a volunteer than to pay a professional). Another is this progressive agenda of increased local, non-professional agency (let’s call it democratisation). One of the questions I asked myself early on was whether these drivers are mutually exclusive: is it possible to both save money and democratise? A related question is whether it is possible to use volunteers to save money without exploiting them. One of my focus group participants told me categorically NO. Putting on good volunteering opportunities takes effort and requires resources. If we’re looking to volunteers to boost our capacity and balance our books, we’re exploiting volunteers and devaluing professional labour. So what do we do when we’re faced with budget cuts AND we want to democratise? In my mind, the only way we can do this is by letting go. I realise this is not possible for everyone, but I wonder whether it is possible more often than we think. Let’s suggest for now that democratisation is positive. If so, the ideal situation is the purple area in the top right of the figure above. My observation going into the PhD was that we were never there, even before austerity, and I didn’t think it looked like we were on our way there either (at least not fast enough!). 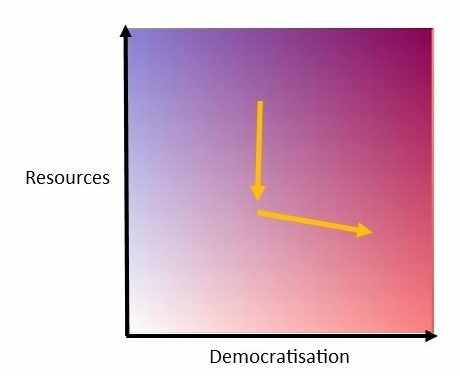 I thought a loss of resources might drop us down into the redder area and drive us to the right out of necessity. This might involve letting go of some of the things we think of as necessary and diverting our attention to supporting people according to their priorities. My current observations are that this doesn’t seem to be happening. There are other ways to maintain capacity and uphold existing priorities despite a loss of resources – like asking people to work for you for free. In this regard (as so many others) trends in the heritage sector mirror those of society as a whole. Paid jobs are transformed into unpaid (volunteer) positions, dressed up in the language of democratisation and celebrated as victories for volunteering. For those who can afford to work for free, this may not be a problem. Austerity will always disproportionately affect those less well off. This brings me to the NCVO General Election Manifesto that says it should be ‘easier for charities and volunteers to support public services’ and the Guardian’s “UK desperately needs new volunteers to fill yawning gaps in public services“. Do we really want more volunteering in public services? Less funding doesn’t magically clear the way for the masses who have yearned to transform local services for free. Less funding doesn’t simply provide rich and rewarding opportunities for volunteers. Local (voluntary) input may improve public services (heritage included), but this input must be resourced so everyone can participate, and facilitated so participating is meaningful. I think change is needed. I think democratisation is positive. I think this must involve some letting go. I think a loss of resources can prompt beneficial discussions about priorities. I still think we need to reassess and renegotiate roles, responsibilities and priorities. We don’t need austerity to do this. Unpaid jobs should not be celebrated. Purple will always be better than red.